Ideal for making a shirt and skirt look more business like, this Tastex® pure wool long line sleeveless cardigan is just what you need to give style and warmth without the weight of a full cardigan. 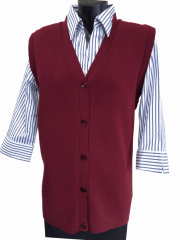 The cardigan shown here is in ink, and is available in any of the standard corporate colours. Combinations of colours, or special colours, can be knitted to order with bands in your own corporate colours. Corporate logos can be embroidered onto the garment prior to delivery. Tell us your colour preferences and size and we'll do the rest. Our range of Tastex Corporate knitwear includes jumpers, cardigans and vests in attractive colours and a range of weights for year round comfort in every working environment. Our knitwear is available in a variety of styles in Tastex® 100% pure wool and Glen Mill® Software wool blends using the finest quality yarns. Tastex can work with you to produce knitwear tailored to your organisation's needs and budget. Crew, Polo or V-neck garments with raglan, set-in or drop sleeves. Long line and crossover cardigans are also available. Pockets, buttons, zips, half-zips and elbow or shoulder patches can be added for an individual touch. All of our knitwear can be enhanced with embroidery. Our professional embroidery service is available to digitise and apply your embroidery at very competitive prices. Tastex® Knitwear's 100% wool garments are machine washable. Our Glen Mill® Softwear garments can also be tumble dried. Tastex garments hold their shape and appearance even after years of washing. If your uniform requirements are specialised our experienced staff can design a garment that will suit your individual needs. All major corporate colours are stocked and we have the capability to match up any unusual colours. Sizes range from 10 to 34 and special sizes may be made to order.